Cheri Tinker, president and executive director of the North Olympic Regional Veteran’s Housing Network, will give a presentation about the power of community engagement to influence positive life outcomes for the homeless veterans of Clallam and Jefferson counties. The April 25 event will begin at 6:30 pm, and is free and open to the public. Tinker and other advocates began with a common vison in 2009, and in 10 years have grown Sarge’s Place, a shelter in Forks for homeless veterans, to include two permanent supportive housing projects and a small farm. It also operates two businesses which help support veterans, and aid in the sustainability of these non-profit programs. 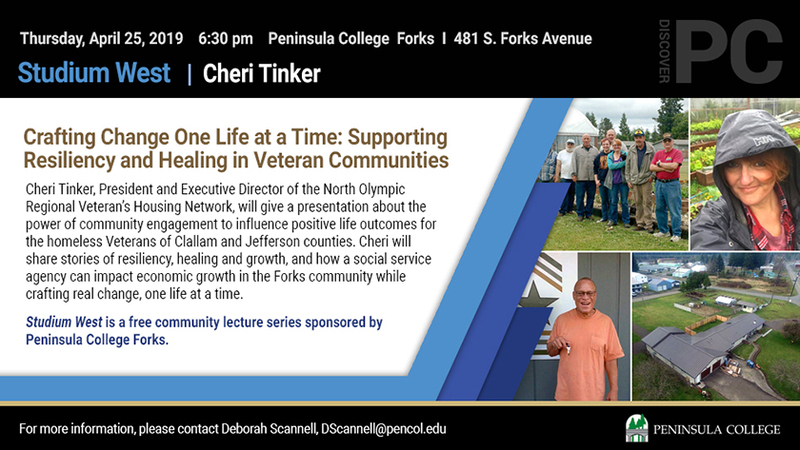 Tinker will share stories of resiliency, healing and growth that she has witnessed in the Veterans of NORVHN, and how a social service agency can impact economic growth in the Forks community while crafting real change, one life at a time. Studium West is a free community lecture series sponsored by Peninsula College Forks, located at 481 S. Forks Avenue. For more information contact Deborah Scannell at (360) 374-3223.